Felpham’s Lisa Phillips followed in the footsteps of Martina Navratilova, Billie-Jean King and Sue Barker by playing in the Surbiton Trophy. The international Challenger tournament was held at Surbiton for the first time since 2008 – the second of three £50,000 tournaments which are all played on grass before Wimbledon. The Surbiton Trophy is for players who have a world ranking inside the top 100 as well as for rising stars. This year, women with world top-100 spots ncluded Vitalia Diatchenko (Russia), Su-Wei Hsieh (Chinese Taipei), Petra Cetkovska (Czech) and Mandy Minella (Luxembourg). The British line-up included six top ten GB women including Naomi Broady No3) and Emily Webley-Smith (No5). In the qualifying round, Phillips was drawn against fellow Brit Louie McLelland, the current women’s Scottish indoor champion. McLelland held the prestigious No1 national ranking top spot as a junior and trains at the Gannochy National Tennis Centre, where Andy Murray started. McLelland was obvious favourite, having had more experience in women’s ITF events and the benefit of LTA funding. McLelland found her form straight away and raced through the first set to win 6-1. In the second set, Phillips improved and went ahead 5-2 but struggled to close the set. McLelland fought hard and edged ahead 6-5. Phillips won the next to force a tie-break, which she won. In the third set, Phillips won 6-3 and to take a long and exhausting match. 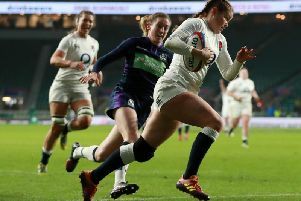 Phillips said: “Most players at this level of tournament have their coach with them but as I travel alone it was really great that the spectators watching were cheering us both on. The win was unexpected and will help contribute towards Phillips’ first world ranking point. In the next round, Phillips faced Tiffany William, who has just returned from training in Tennessee. William has benefitted from six years of playing on the women’s ITF circuit. William took advantage of a powerful serve and good groundstrokes to breeze through the match 6-2, 6-2. But Phillips takes away with her great experience on the international stage. Phillips learned to play tennis a lot older than most top players. She said: “Starting so late in tennis has always meant it has been a case of catch-up in trying to improve my tennis and be good enough to play in club, county, national and now international tournaments.